West Palm Beach, FL – The South Florida Water Management District (SFWMD) has been working around the clock to lower water levels in the water conservation areas to create capacity for sending additional Lake Okeechobee water south, all in an effort to alleviate South Florida's high water emergency. SFWMD Chief Engineer John Mitnik gave an update on the District's operations through the agency's weekly video series, which is dedicated to informing the public on current water conditions and the agency's actions amid the high water emergency. The video update can be seen by clicking HERE or visiting the District's website dedicated to the emergency situation at www.sfwmd.gov/managinghighwater. In the video, Mitnik briefs SFWMD's Governing Board at its regular monthly business meeting about the latest water conditions and actions being taken to lower water levels. Rainfall in June and July was about average or slightly below average, allowing the District to utilize several measures to move water. 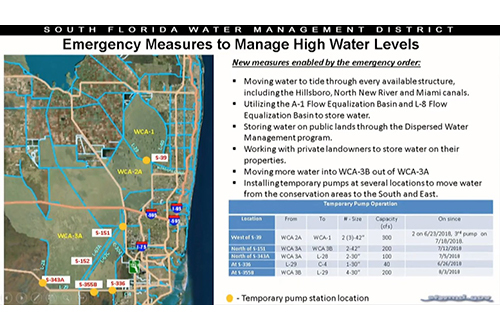 Mitnik showed in his update how the measures being used have lowered water levels in all three conservation areas and are continuing to lower those levels to make room to move water from Lake Okeechobee south. At the Aug. 9 Governing Board meeting, SFWMD Chief Engineer John Mitnik provided an update on water conditions around South Florida and the District's ongoing efforts to alleviate the current high water emergency.